The "obvious" that they looked at was the fact that without forcing, the earth system is stable over the long run in terms of energy. That is, for the oceans and atmosphere to heat up over the long term, extra energy has to be put into the system. It won't happen all by itself. There are temperature fluctuations in the short term in different parts. For example, ENSO events shift heat/energy between the atmosphere and the ocean. But that's just shifting energy around. If there's a short term imbalance, the system adjusts over time. For there to be a consistent long term increase in global temperature, there has to be additional energy retained in the system, such as more energy coming in from the sun, or more greenhouse gases. To be more specific, taking known physics, it's expected that the average net radiation imbalance at the top of the atmosphere (N) will change in the opposite direction to temperature trends at the surface. All things being equal (no forcing), if the surface temperature goes up like during an El Nino, at the top of the atmosphere more energy will go out of the system (negative N) than comes in until the system gets back to "normal". The surface temperature will get back to "normal" over time returning to balance, with as much energy going out as coming in. The opposite would happen with the temperature drops like during a La Nina. If the global mean surface temperature is falling, then less heat would escape the system (positive N). The surface temperature would get back to "normal" over time with the system as a whole returning to balance, with as much energy going out as coming in. That seems so evident that we take it for granted (that is, unless you believe in magical Little Ice Age bounces). You'll see something not dissimilar every day. Pour yourself a hot mug of coffee and let it sit. It won't be long before the coffee cools to room temperature. (You wouldn't notice, but the surrounds will increase in temperature slightly from the heat escaping the coffee as it cools.) That's not exactly the same. The Earth is in space and gets its energy from the sun. But it's not that different. Given it seems obvious, you might wonder how a paper on the subject was accepted. Well, what this research team did was look at what happens all around the planet when there's a change in temperature at the surface. There are a lot of things that change when there's an unforced change in global mean surface temperature and, as with most things climate, it's complicated. First of all, they were able to show that the above is what happens overall, using observations (actual measurements) as well as state of the art climate models (AOGCMs). It's observed in both - the real Earth and the modeled Earth. With that out of the way, they proceeded to describe just what happens at the local or regional level, looking at changes in different parts of the world, to keep it in energy balance. What they found was that at a local spatial scale, when the surface temperature goes up then over most of the planet's surface, the opposite is happening to what is happening in the system as a whole. That is, surface temperature goes up locally, and at the top of the atmosphere locally there is less energy going out than is reaching the surface. Or to put it another way, more energy keeps coming in than goes out. How can this be, particularly when, if the mean surface temperature goes up, the system as a whole is pushed toward stability by emitting more energy than is coming in until it's once more in balance? In the cold regions ice reflects the incoming shortwave radiation back out (albedo). When the surface gets warmer, there's less ice so less shortwave radiation is reflected back out, while the same amount of energy is coming in. In areas where temperatures are higher, when it warms up there are fewer clouds reflecting short wave energy back out before it hits the surface. That is, the warmer surface changes the nature of the clouds so less shortwave radiation is reflected, while there's no change in the energy coming in. Over the oceans that have the warmest temperatures, the oceans get warmer, more water evaporates, so more longwave radiation is emitted from the water vapour in the atmosphere, which heats up the oceans more. In other words, locally over much of the earths surface, when the surface temperature goes up above the climatological mean, then the local response is to heat up even more. These local effects are the opposite to the global situation. The exceptions to the above are high latitudes and some specific continental regions. 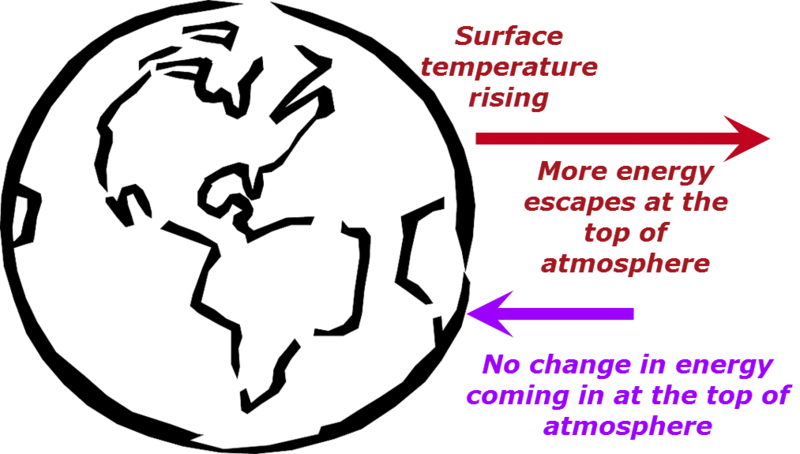 In the system as a whole, if the surface temperature goes up then more energy goes out of the system back to space until the planet reaches energy balance again (incoming equals outgoing). At the local level over most of the planet, the opposite is the case. So what is the missing link? How can these differences be reconciled? 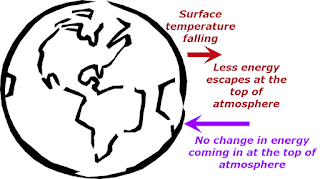 adjustments in the large scale atmospheric circulation. "convergence of atmospheric energy transport at high latitudes", where the relationship between temperature and TOA net radiation imbalance is negative (ie hotter surface and more energy going out at the top of atmosphere). So while one part of the world is getting hotter (gaining energy), another part is getting colder (losing energy to space). Overall, the energy going out to space soon stabilises and equals the energy coming in. That's assuming there is no additional ongoing forcing. Now it's a bit hard to keep track of the parts that lose more or less energy to space when there is a temporary rise or fall in surface temperature, so I might have got things a bit mixed up. I think I've got it right, but feel free to point out any errors. The overall message is that if temperature rises from some internal variability, the system as a whole will adjust and get back to normal, by transporting energy through large scale atmospheric circulation to parts of the world that will send the extra energy out to space. The new evidence may finally help put the chill on skeptics’ belief that long-term global warming occurs in an unpredictable manner, independently of external drivers such as human impacts. “This underscores that large, sustained changes in global temperature like those observed over the last century require drivers such as increased greenhouse gas concentrations,” said lead author Patrick Brown, a PhD student at Duke’s Nicholas School of the Environment. There's not much to add. Anthony Watts didn't like it. He found a different headline and said: "From the “language gives away the intent of the study” department comes this clear attempt at a headline." Most deniers seem to think that the world can heat up by magic. Many of the people popping their thoughts on the WUWT pin-board aren't able to understand the concept of energy flows and stabilisation. I didn't think it would be that hard to understand. In a steady state system energy in = energy out. If "energy in" increases, "energy out" will increase until "energy in" again equals "energy out". If "energy in" keeps increasing and then stops increasing, then it will take a bit longer to restabilise the system. If "energy in" doesn't stop increasing, then things will keep heating up. Does he not agree that ENSO events shift heat around the system? Did he not bother to read the paper before he commented? I wonder if he even bothered to read the press release properly. In the rest of the WUWT discussion thread there were a lot of silly thoughts about "models", but none about the scientists' discussion of observations, or not that I saw. Dear me, where does one start with stuff like this? What Ice Age? Never happened. That would mean natural variability; can’t have that. Aphan is another one. In fact he doesn't even believe there is any such thing as an El Nino. Yes, rgb must know why they think @Duke that without external forcings temperatures meander around a balance, and when there is external forcing they do not. I don't know if A C Osborn is embarrassed for his fellow deniers not understanding simple energy flows, or if he is admitting he's never understood radiation himself. How to make a complete and utter fool of yourselves and the various places they work for. I am embaressed for them. Bruce Cobb is another one who doesn't understand that if you light a blowtorch and turn the flame on a block of wood, the block of wood will get rather hot. So hot it will burn. When you turn off the blowtorch, after a bit the temperature of the charred wood will be the same as its surrounds. So, natural warming such as the MWP leads to cooling, due to this “Planck Response”, but “manmade warming” doesn’t. Different type of warm particles, I guess. Did they just discover than human Co2 molecules produce an entirely different degree/type of warming that “natural CO2” molecules do? *insert image of insane person rubbing hands together and cackling* MUhahahahahahahahha now we can control the world! andrewpattullo is another one who doesn't know the difference between forcing, feedback and internal (unforced) variability. The last being a shifting of energy between the atmosphere, the oceans and the land surface. Is it really so hard to understand? Are these people really so proud of their ignorance? How does one publish this with a straight face? We have, as per the “consensus”, only about 65 years during which global temperatures might have been influenced by human generated CO2, and only a few decades of satellite measures. The geologic, fossil, ice core, and sedimentary records however show dramatic swings in global temperature and biosphere productivity that all precede human civilization. How can they claim any significant global temperature shifts must have unnatural external forcing to blame? ntesdorf seems to think that the planet stops receiving or emitting energy during an ice age. I've no idea why he thinks that. Deniers need to learn some high school physics. ristvan is another one who you'd have thought would have taken the time to get some basic understanding of physics before he self-published all his silly books. You are watching a Ph.D climate student prostrated on the alter floor of the church of warmunism, taking his priestly warmunist vows and then offering climate model communion. Nothing more. Cause the fact (per Lindzen) that the ~1920 to -1945 warming (not CO2) and ~ 1975-2000 ( all CO2) are statistically indistinguishable, or the fact of the now near 20 year pause (except in karlized temps) falsifying all climate models are noticeably missing in action. No doubt expunged by copious warmunist incense dispensed at the J. Climate ‘ceremony’. Gosh, every month warmunism gets more ridiculously detached from reality. ShrNfr must have posted his "thought" on the wrong thread by mistake. So, we’re are back to the Mann Myth that the Medieval Warming Period, Roman Warming Period, Minoan Warming Period, and what is probably a warming period at the end of the Old Kingdom in Egypt (~2050 BCE) never happened. Oddly, stuff like the C14 age calibration curves say there was less C14 produced during those warming periods. The rest of the comments don't look much different to the above. Almost all the WUWT-ers seem to be insisting that the Earth can heat up by magic and presumably cool down by magic. They don't "believe" that the planet has the means to adjust the energy going out to space to match the energy coming in from the sun. They don't "believe" that the planet as a whole seeks to balance incoming and outgoing energy over time. They must "believe" in runaway warming and cooling, which is quite odd. Recently there was a very good guest essay on the Ed Hawkins site about EEI. The mighty AMO, their favorite ocean cycle, has not caused a visible cooling - as in, an actual sustained downward trend - of the GMST anomaly since ~1910. So I do not see how the message of this paper can be news to them. The mid-century cooling started long before the AMO declined, and immediately after the PDO started to visibly decline. So yes, in 1942 a natural cycle actually worked in the old-fashioned sense. For about ten years. And then, well, then ACO2 knocked it to kingdom come. Pour yourself a hot mug of coffee and let it sit. It won't be long before the coffee cools to room temperature. Funny that an advertising agency expected football fans would understand that point well enough to build a joke around it for a 60-second beer commercial. But our modern Galileos seem to have difficulties with it. One wonders how many seconds it takes a steaming mug of bulldust to cool to room temperature. I suspect we'll never know as it is constantly replenished and tendeth to runneth over. That earth's energy imbalance and a coffee cup El Nino on display. Anthony's article was indeed ridiculous, I could not find enough rocks out in the yard to pulverize with my head after reading it. A teensy error in your article; Aphan happens to be a she, which I am clued into because others at WUWT refer to her as such, and she's mentioned having a husband where they live in Texas. Thought you'd like to know since she's prolific and you've quoted her before. Long time reader, first time commenter. Great article.
" The way the WUWT ratbags are carrying on, you'd think they'd never come across this concept before." It's perplexing that those who claim scientists know "nuffing" don't understand a few basic concepts.
" Global climate is determined by the radiation balance of the planet (see FAQ 1.1). There are three fundamental ways the Earth’s radiation balance can change, thereby causing a climate change: (1) changing the incoming solar radiation (e.g., by changes in the Earth’s orbit or in the Sun itself), (2) changing the fraction of solar radiation that is reflected (this fraction is called the albedo – it can be changed, for example, by changes in cloud cover, small particles called aerosols or land cover), and (3) altering the longwave energy radiated back to space (e.g., by changes in greenhouse gas concentrations). In addition, local climate also depends on how heat is distributed by winds and ocean currents. All of these factors have played a role in past climate changes." Internal variability in the climate system usually arises from a redistribution of energy between the different subsystems (e.g. between ocean and atmosphere via the type of couplings mentioned by Mike M.). If through these semi-random variations the earth’s surface heats up, the earth will also lose more energy to outer space (governed by Stefan-Boltzmann as you say: E~T^4). As a result the earth will cool down. In other words, this provides a powerful negative (stabilizing) feedback and prevents small variations in surface temperature from growing out of control. If on the other hand the surface temperature is raised due to a radiative forcing (a change in the balance between incoming and outgoing energy), the temperature increase is a way for the earth to achieve equilibrium again between incoming and outgoing energy fluxes (a higher surface temp causes more outgoing energy, via the same E~T^4, until it’s equal again to the incoming energy). The radiation balance thus is a strong constraint on surface temperatures (or actually on the effective radiation temperature of the planet, but that’s linked to the surface temp viathe lapse rate)." Your article adds interesting details to my basic understanding of the bigger picture.